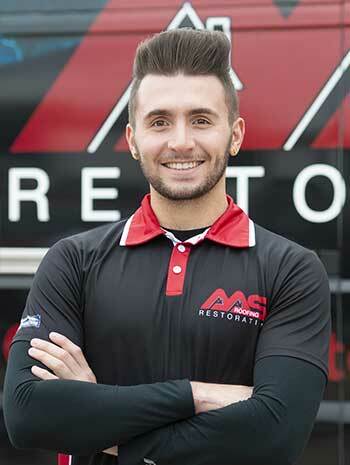 Jeff Turano, COO and Member, has spent more than 25 years in the roofing industry. Having been in all facets of the roofing industry he brings skills in operations, project management, and product development. He is looking forward to building upon the solid foundation that has been in place for years and is thankful for all the support received from family, friends, and business partners within the industry. 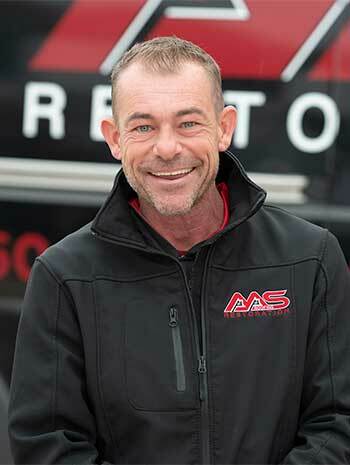 Stephen Storts, President, Director of Restoration Operations and Member, has served as Director of Operations since 2007 and as President since 2010. 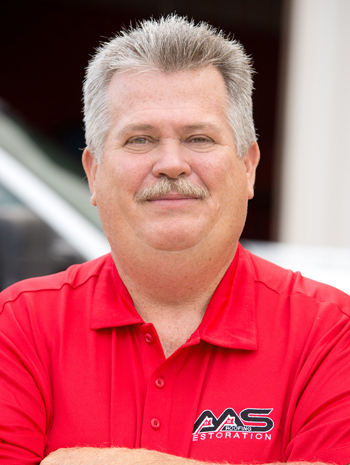 He joined his parents in 1993, learning the many facets of the restoration business from laborer to estimator to director before taking over as President after Bruce retired. He completed a four-year tour in the Navy, serving in the first Gulf War aboard the USS Worden as an Operations Specialist. He is currently in the Air Force Reserves assigned to Whiteman Air Force Base as a Controller in the Command Post. 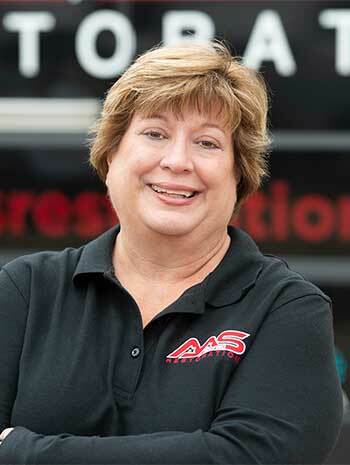 AAS Restoration former owners, Bruce and Amy Storts, grew up in a small, rural town in eastern Missouri, but they have called Blue Springs, Missouri home since 1973. In establishing AAS Restoration, they used their background of small town sensibility and strong work ethic to set unmatched quality and customer service standards. Those standards are still the hallmark of AAS Restoration today as every employee is expected to use those same standards as their personal benchmark. Bruce retired in 2010; Amy continued operating the business until the fall of 2015 when she sold the company’s assets to her son Jeffrey and his business partner Jeff Turano. She joined her husband in retirement November, 2016. 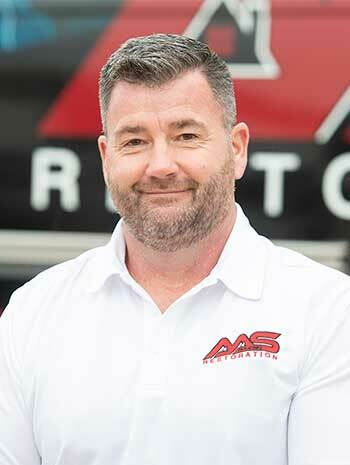 Joe Bullard, Operations Manager of Restoration Division, already had more than 25 years in the restoration field when he joined the AAS Team in 2016. That experience included working as a commercial project manager and field superintendent as well as a residential project manager and estimator. Joe has the following certifications: National Class A General Contractor; Haag Certified Inspector – Commercial and Residential; NARI-Certified Remodeling Project Manager; and IICRC-certified in Water Damage Restoration and in Applied Microbial Remediation. Joe also serves as a First Responder. 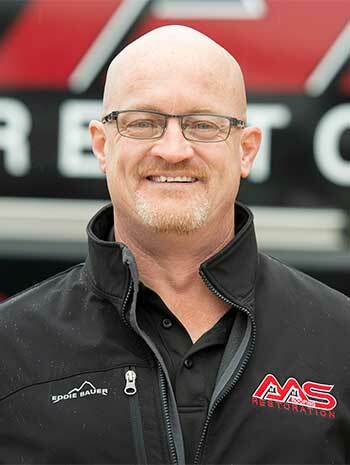 Bruce Cave, Vice-President of Operations and Contents/Mitigation Production Manager, has been in the restoration business since 1990, and with AAS since 2002. His numerous IICRC certifications include Journeyman Textile Cleaner, Journeyman Water Restorer, and Journeyman Fire and Smoke Restorer. He is a Vortex Drying Specialist, a Certified Green Risk Professional, and is certified in Biohazard Cleanup. Bruce also serves as a First Responder. 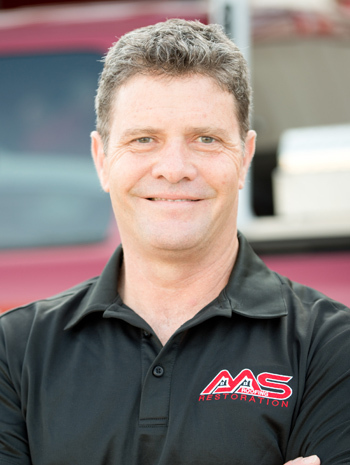 Philip Rinehart, Senior Restoration Estimator/Project Manager, brought 23 years of experience with him when he joined the AAS Team in 2018. Philip is IICRC-certified in Smoke, Fire, Water, Textiles, Leather and Mold. He is using his expertise to write estimates and to work with adjusters and clients ensuring a smooth claim process. He will oversee the subcontractors and employees on his projects and address homeowner concerns as the restoration progresses. Phillip also serves as a First Responder. 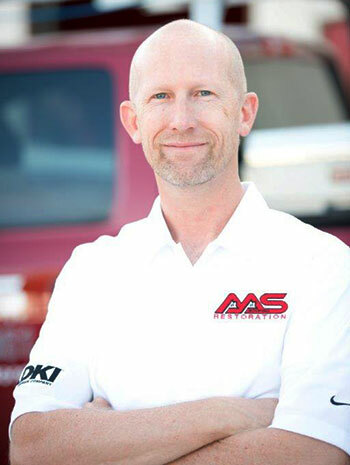 Brad Noll, Restoration Estimator/ Project Manager, brought five years of experience in the metal fabrication field with him when he joined the AAS staff in 2015. 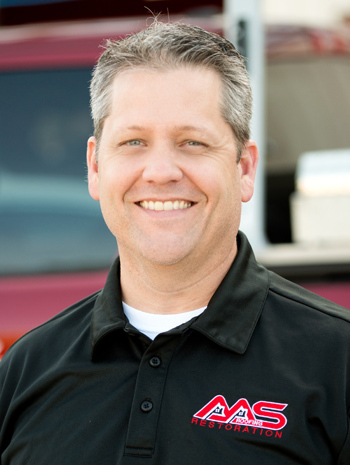 Brad has a broad background in the restoration field, writing estimates, and working with both adjusters and clients to insure a smooth claim process. He will oversee the subcontractors and employees on his projects and address homeowner concerns as the restoration progresses. Brad also serves as a First Responder. Tom Koehler, Field Supervisor, became a team member in 2016 sharing with AAS his 20 years as a home builder and project manager. He is on the job site as often as needed to insure the job runs smoothly. Tom has a Contractor’s License as a Residential Building Contractor. Tom also serves as a First Responder. 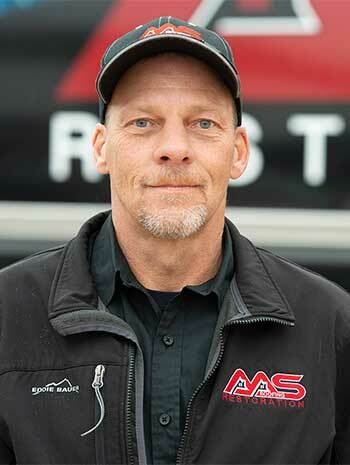 Chad Zard, Roofing Inspector and Field Supervisor, joined the AAS Team in 2017 with 30 years’ experience in the roofing field. He owned his own roofing business for 10 years and served as a roofing inspector for another 10 years. Tammy Berry, Corporate Accountant, joined the AAS Team in 2018. Tammy came with an Associate’s Degree in Accounting, a Bachelor’s Degree in Business Administration, and 30 years of experience in accounting including working with H & R Block since 2008. She utilizes her skills in accounts payable, banking, payroll, and taxes. Shay Smith, Human Resource Manager, joined the AAS Team in 2018. She serves as the Team Coordinator for the Restoration Division as well. Shay brought with her many years in the business administration arena, both as a business owner and as a property manager. As Team Coordinator Shay will be working with the client, estimator, production manager and adjuster to ensure communications are maintained with all parties. 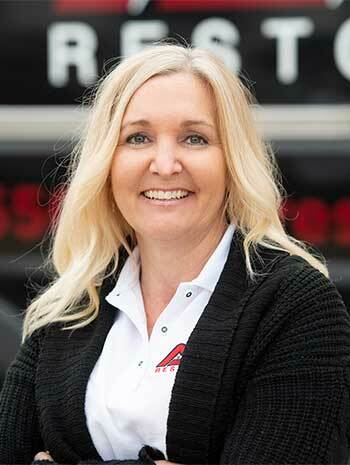 Jennifer Beitling, Team Coordinator for Contents/Mitigation Division, was new to the restoration business when she joined the AAS staff in 2016, but she brought 5 years of office experience to her position. She works with the client, production manager and adjuster to ensure communication is flowing smoothly. Jennifer will be striving for 100% customer satisfaction with each call she takes. 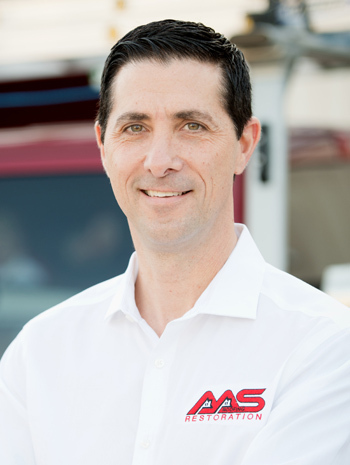 Anthony Fanara, Roofing Saleman, joined the AAS Sales Team in 2018 with 15 years in the roofing sales field. He is also an experienced painter and has 500 hours of OSHA’s Lead Safety training. 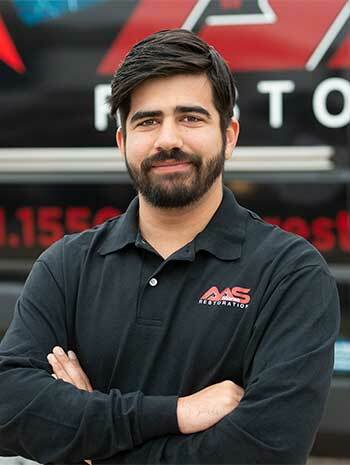 Dylan Storts, Roofing Salesman, joined the AAS Team in 2016 after working as project manager for a commercial restoration company in Denver. He’s been in the sales field for four years and is certified in water mitigation as well. 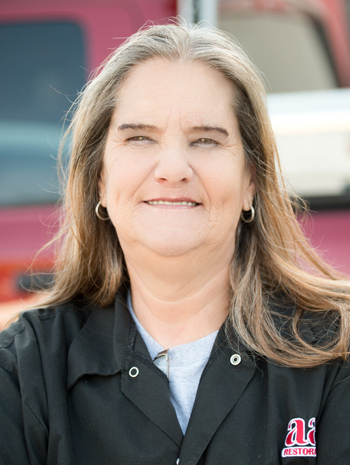 Pam Cummins, Warehouse Supervisor for the contents-cleaning division, had five years experience in the restoration field before joining AAS in 1999. She is certified in Odor Control Water Damage Restoration and Fire and Smoke Restoration. She is also certified in Mold Remediation. 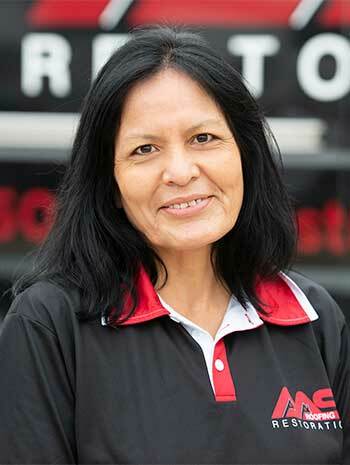 Irene Roy, Lead Water Technician, joined AAS in 2013 with more than 20 years of prior experience. Irene has completed both the Water Class and Applied Structure Drying courses. 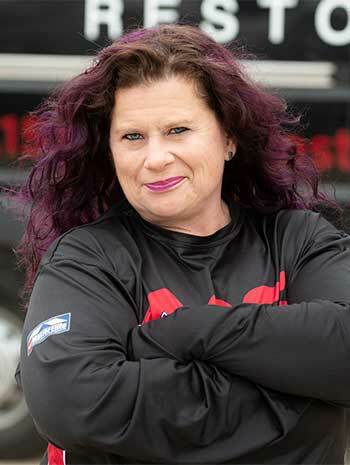 In addition, Irene is the Lead Technician for the Laundry and Sportsgear Cleaning Division. She is certified through CCRN (Certified Contents Restoration Network) and is trained to operate the Esporta Wash System. Stacey Skiles, Lead Mitigation Technician, joined the AAS Team in 2016 with four years of prior experience. 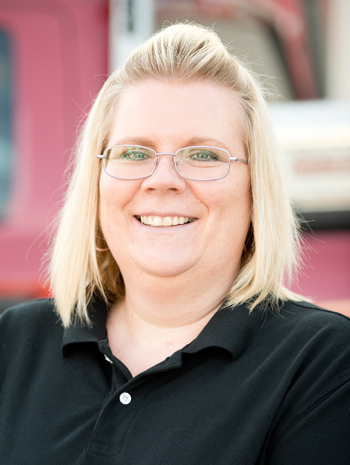 Stacey is IICRC-certified in Fire, Smoke, Odor, and Water. Brennen Balandron had three years’ experience in the painting field when he joined the AAS Team in 2018.